If you thought Ryan Gosling's video of a Congolese girl dancing was the culmination of his campaign to reduce all of womankind to quivering balls of squee, you thought wrong. 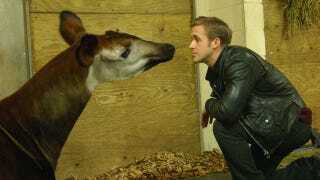 Today the Cincinnati Zoo posted an entire gallery of Ryan frolicking with zoo animals. Brace yourselves. Clearly zoo officials only invited Gosling and Evan Rachel Wood, who are filming a movie together, to take a private tour as part of a ploy to get free publicity — not that we hold it against them. If we though Ryan had any interest in watching us type, we'd do the exact same thing. Here's Ryan with Charlie the African penguin. Ryan and Evan with Moe the sloth. Ryan with Mai Thai the Asian elephant and elephant manager Cecil Jackson Jr.
Ryan feeding Nikki the Indian Rhino. Ryan, Evan, and some other ladies with the Asian elephants. A violet turaco flying to Ryan. Ryan with Caroline the porcupine.